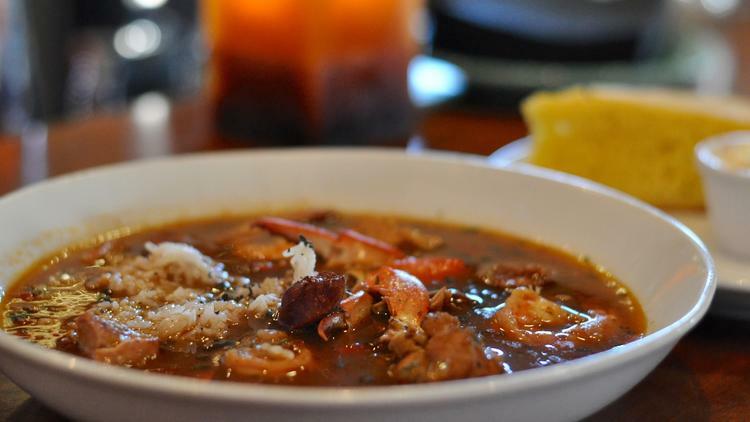 On Tuesdays at Post & Beam, Govind Armstrong's swank restaurant next to the Baldwin Hills Crenshaw Plaza, not only will you find a menu of Southern-influenced cooking, but also, for the last six weeks or so, bowls of extraordinary gumbo. This is not because Armstrong cooks a mean gumbo, although he does — but because 90-year-old Edith Bell does. Bell had been a regular at Post & Beam — along with her sisters, granddaughters and great-granddaughters — since it opened, and it seemed that every time she came in, Armstrong says, she'd talk about her gumbo. The Louisiana native would tell stories about her decades of cooking for her family and for other people. She once cooked for Muhammad Ali. Armstrong kept asking her when they were going to cook together. "Finally one day, she came in and brought all the ingredients to make gumbo," Armstrong said. "That was the beginning. It was a project." A project that became public, as Armstrong put Bell's gumbo on the restaurant's Tuesday night menu. "Her method is similar to mine — I've made gumbo a lot — but it's really not about the ingredients. It's the way she makes the stock, peels the shrimp." That said, Bell was quite particular about the sourcing, making sure that Armstrong got his bread from Normandie Bakery and his sausage from Bell's little butcher shop. "She dancing while she's cooking," Armstrong recounted, "while I'm asking her, '[am I ] burning this roux?' "
Armstrong says that May 19 will be the last Tuesday for gumbo, as the season for blue crab (an important ingredient) is finishing. But no worries, he's getting Bell's jambalaya recipe, which will probably be going on the menu next. "It's going to be a weekly thing." Last October, John Mascarenhas partnered with Post & Beam restaurateur Brad A. Johnson to turn Abbot-Kinney's longstanding Lily's into Wolf in Sheep's Clothing, taking the same lupine name of the owner's popular pop-up, even as the chefs who built a buzz around its cooking were going on to Southern glory at The Hart & The Hunter. The appropriation of the name didn't sit well with everyone, but it still never seemed to stop the restaurant from being packed. 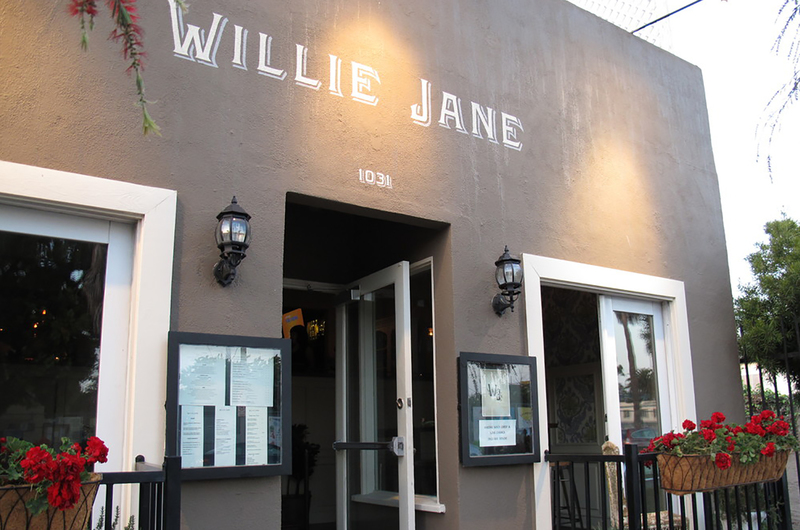 Last weekend, the partners started anew, reopening the restaurant as Willie Jane, named for Johnson's Southern centurion grandmother, and featuring menus from Govind Armstrong, the locally-raised, local product-obsessed chef who chased the demise of his Table 8 empire with the more rooted Post & Beam in Crenshaw Plaza. The new restaurant hits you over the head with its theme of dressed-up Southern cuisine cleverly stitching down-home elements into a general California sensibility where meticulous market ingredients steer the ship through Mediterranean ports of call. To this end, Armstrong's menu features dishes like a sweet tea-brined pork chop with date mostarda, rainbow trout with black eye pea hummus, and cast iron chicken with cornbread panzanella and collard green pecan pesto, along with sides like long cooked Blue lake green beans with pear chutney and toasted farro and grilled leek porridge with picked hog meat, with dishes mostly priced between twelve and 24 dollars. A market-priced menu features three larger format dishes, including a sort of Caribbean fish-out-of-water of curried oxtail with grilled plantains and charred curry leaves that already has us moist of mouth. Cocktails, meanwhile, stick to the same Southern theme with cherry lime rickeys and Coal Miner's Daughters, served aside Cajun classics like the Sazerac and Vieux Carre. Check out the full current drink and food menus below, available over dinner at Willie Jane. Govind Armstrong has a long history in this town, dating back to when he worked as a 13 year-old apprentice for Wolfgang Puck in Spago's kitchen. Armstrong, who is still maybe younger than you are, went from Spago to City to Campanile, with time spent time in European kitchens, including Juan Mari Arzak's in Spain, before opening Chadwick with Ben Ford. Armstrong opened Table 8 in 2003, which was reinvented as 8oz. in 2008, and closed permanently a few months ago. Add appearances on Top Chef and Iron Chef, and it's no wonder that the man might want to get off a plane and come home. GA: Yes, two currently -- one in Louisiana, one in Miami. And 3 locations are currently under construction -- one in north Miami, and here in L.A., the first of which will be at LAX. SI: When is that going to open? GA: I'm not sure exactly; sometime next summer. It's a big development project and partnership with HMS Host, and you know how that goes. I'm excited about it -- it's an interesting partnership and looks to be a pretty amazing project. SI: You grew up here? GA: Yeah, yeah. Born here in Inglewood. I spent some time in Costa Rica; that's where my mother's from. Then came back and we lived in the Valley for awhile, been around. But L.A. is definitely home. SI: So what are you planning on doing? GA: Ahhh, well, I'm definitely now in full "doing" of what I've been planning for several months -- and I'm really excited about it. I've partnered with Brad Johnson to open a new restaurant in the heart and soul of L.A. in Baldwin Hills Crenshaw Plaza. I was born right down the road there. It's a very interesting community that's currently undergoing a major revitalization. We hope to create a destination restaurant that is the centerpiece for the community. I haven't been this excited about a project in a long time. It's brilliant to be a part of such refreshing developments -- bridging the lines of L.A.'s vast landscape -- dining and otherwise. You know, the more I talk to people in the community, they're just excited to have a place to call their own. SI: What was the space originally? GA: It was a Golden Bird actually. Golden Bird was an old fried chicken institution, a big chain back in the day, and this location was one of the first. It had very interesting architecture. We basically stripped it down to the studs and some of the load-bearing walls. SI: Roy Choi's place went into an IHoP. Which is just what Armstrong has done. The chef and business partner Brad Johnson are opening Post & Beam in Baldwin Hills in a month, maybe two. The new restaurant is going into the Baldwin Hills Plaza, along with the chef himself and his staff from 8oz. The location, which is still under construction, will seat 100 ("on paper," says Armstrong, "once the furniture comes in, maybe about 80") in a 2100 square foot space that was once a Golden Bird. For more details on Armstrong's new project, the kind of food he'll be cooking, and why he wanted to come home, turn the page. Squid Ink: What's up? You're back in town. Govind Armstrong: I've been back for awhile, I'm happy to say. I'm definitely spending a lot more time and focused attention in L.A. I've been bouncing around for several years. L.A.'s always been the base, always been home, but with all the other projects--I was living in New York for a long time, spending a lot of time in Miami and getting back to L.A. only every other month or so. People think it's this glamorous life, but it really is not. It's brutal. I've been looking forward to getting settled back in LA. All my family's here: my mom, all my sisters, and my girlfriend. I'm happy to be home and putting my time and creative focus into developments here. SI: When did you close 8oz.? GA: Very unfortunately, we were forced to close 8oz. on Melrose about 2 1/2 to 3 months ago now. There were a number of reasons for that, which ultimately came down to inoperable issues with the lease that we signed almost 9 years ago. We had great success in that location with the original Table 8 and then with 8oz. ; we had a successful business and the community really loved it. I loved it. We tried renegotiating, but it was just one thing after the next. It became really frustrating, as we but it just wasn't going to work out any longer in that space. It was tough - but we are moving on. SI: You have other 8oz.'s. SI: So why Post & Beam? GA: It's sort of an homage to the neighborhood. A lot of the homes in Baldwin Hills have that old post and beam architecture. It's definitely something that's very reminiscent of the era, when it was in its prime in the 50s and 60s. It's a perfect little venue: we have a fair amount of outdoor space, where we're planting an herb and vegetable garden. I'm not bringing in any "hallelujah" anything, it's a straightforward, familiar kind of spot -- a cool neighborhood restaurant with broad sensibilities and local character. SI: So do you have a rough target date? GA: Ha. It is a moving target. But we're getting closer and closer. It looks like mid-September. Everything else I've been working on, I'll still go and set up shop. But I just really want to be back in the kitchen and spending more time cooking. As opposed to managing, which can be fun and it's obviously doing both at the same time, but I really miss it. SI: You always wonder about chefs who have reached a certain point in their careers who spend less and less time in the kitchen. You're running around your empire: don't you miss the kitchen? At what point do you want to go back? GA: You miss it. I've been cooking at home a lot. I think I've destroyed my Viking range. SI: Then you need a restaurant, I guess. GA: I do. It's fun to cook at home, but it's more like recipe testing -- as the 6 people who follow me on Twitter can attest. Now I'm looking forward to getting back in touch with L.A. diners -- it was always great to be in the kitchen and on the floor at 8oz. -- 8oz. is something that I'm very proud of... and making the personal connection with friends and guests that filled the restaurant every night is what it is all about. We built an open kitchen at Post & Beam for that very reason. SI: But you're not going to open another 8oz. here? Other than the one at LAX. GA: Not on Melrose, I'll tell you that much. There are still a few that are in the works, but my focus is on this. I still crave a great burger. SI: Will you have a burger on the menu on the new place? GA: No, not at the moment. I say that now... But then I say that I won't put things on menus, and then learn otherwise. I'm still playing with the menu. SI: It sounds like what you started doing in the first place. Farm-to-table. GA: Exactly. And that's what I have been doing. Getting out to some interesting farms. I've been dying to get out there, but when you're caught up in everything, it's hard to focus and do those things that you really want to do that mean a lot to you. Post & Beam is definitely allowing me to do that and then some, which I hope will be evident in the overall experience. The restaurant and the menu celebrates locality, from the growers and purveyors, to Los Angeles -- the people and the food, and California in style and cuisine. It's seasonal ingredient-driven, open hearth cooking, with a focus on sustainability, whole animal utilization, definitely -- no Fear Factor approach -- it just needs to make sense. I can't complain. If anything it's been a fun ride and I've met some great people. GA: That was a couple years ago. That was really interesting, to say the least. It was a great time. I was on a radio show and she's going through my book and she became obsessed with the grilled cheese and kind of snowballed from there. Two days later I was sitting on the stage with Oprah. The whole thing was so surreal. We made it and then we flew out to Chicago and I made a couple sandwiches. All my sisters and my mom flew out with me; they were ridiculously excited. They freaked out. It was just nuts. So much fun. SI: So how long ago did you find the Baldwin Hills location? You've been under the radar. GA: Brad showed me the property a long time ago, maybe a year and a half ago. We signed the lease maybe 8 months ago. We've stayed under the radar. I'm not hiding anything. I drive an old convertible. But who's cruising around Baldwin Hills, you know what I mean? There's no need for a lot of hoopla. He is one of California's most talented and accomplished chefs, yet Chef Govind Armstrong continues to captivate the stomachs of new foodies each and every year. Owner of the restaurants, 8oz. Burger Bar, and author of "Small Bites, Big Nights: Seductive Little Plates for Intimate Occasions and Lavish Parties," Armstrong's passion for cooking has taken him on a culinary journey all over the world and right into our stomachs. When I spoke with him over the phone this past February, he was just returning from the Food Network South Beach Wine and Food Festival and preparing to leave the country on a mini "workcation" with his mother on a cruise to the West Indies and Caribbean. Some R & R was definitely on the menu after maintaining a demanding schedule yearly that includes managing four restaurants with others on the way, being a member of Macy's culinary advisory board, a culinary ambassador for New Zealand, and attending guest appearances and book signings. Born in Los Angeles with maternal roots and summers spent in Costa Rica, Armstrong was living his dream by age 13. Growing up, his mother entertained a lot and that eventually rubbed off on him. At first, being in the kitchen was a way to spend time with her but after a while, he took over and was officially the chef of the house creating the menu and doing the shopping. He admits, "It got to a point where I was a little obsessed with it." However, this obsession would soon pay off. As a junior chef on the move, it was during one of his mother's dinner parties that someone asked who prepared the food. When she found out it was 12-year-old Armstrong, she was in disbelief and had to meet him for herself. He remembers the kitchen being a disaster at the time as he didn't learn how to clean as he went along. During their conversation, she mentioned that she was opening a restaurant with Wolfgang Puck and wanted to introduce Armstrong to him. Although he really didn't know who Puck was, he knew it would be a great opportunity. A week later, the two met and he was offered an apprenticeship which he worked for three summers. "I still talk to Wolfgang every now and then. I still go to him for advice and he always has been very supportive." His next opportunity would come in high school, while he was dining with his mother at a restaurant in L.A. The restaurant's owners came out and starting talking to them. After they discovered he could cook and had worked with Puck, they hired him to work at their new restaurant that was opening on La Brea. He worked after school and on weekends and would stay there for three years noting it as another great experience that has helped shape his career. With more than five years of experience in the kitchen, he moved to San Francisco and attended San Francisco State University, but was at a crossroads and decided to pursue another path. Soon he caught the travel bug and continued to nurture his passion for food and eventually spent time cooking in Spain. He opened his first restaurant, Chadwick, in Beverly Hills in 2001. Armstrong believed in sourcing locally and seasonally as well as growing his own food to be used at the restaurant. Not knowing that he was ahead of his time, he has been called a "leading pioneer of organic farming." "In LA we had gardens growing up as well and that was like a big part of me actually understanding the difference between commercially grown vegetables and stuff you can actually grow organically in the backyard." Although it was a great restaurant concept, he says everything was very expensive to operate and they eventually closed the doors. Taking business lessons with him, he opened Table 8 on Melrose Place in 2003, which focused again on seasonal ingredients from local producers served on small plates for customers to really enjoy a bite of California cuisine. Table 8 in Miami opened in 2006. Both locations were reinvented into 8 oz. Burger Bar, and in partnership with Harrah's Hotel & Casino, he opened additional restaurants in Shreveport and New Orleans. Projects in Houston and Seattle are on the table now. After the first Table 8 restaurant opened, more opportunities appeared including being on the list of People magazine's "50 Most Beautiful People" in 2004, writing and having his first book published in 2007, appearing on Oprah and other TV shows, battling against Bobby Flay on "Iron Chef," and being a guest judge on "Top Chef." Armstrong has always let his passion for cooking lead his career and the opportunities seem to follow. When it is time for him to relax and reflect, he noted that some of his favorite spots in the world include Thomas Keller's French Laundry in Yountville, Calif., and River Café in London. Next culinary getaway on the list: Indonesia. With an eclectic palate and well-stamped passport, he advises anyone who is traveling to mix meals up between the hidden gems recommended by locals off the beaten path and the more commercial eateries. As a pioneer and ambassador of California cuisine, I am sure the next piece of advice would be to enjoy everything with an open mind, because you never know where that meal could lead you.